Initially, the beautiful blonde became famous in her native country, Spain, and the conquered Europe. Beyond Re-Animator, Romasanta, and Ninette were the first Spanish movies that brought her popularity. In 2005, the woman got famous in Hollywood when she appeared in Fast Five with Vin Diesel and Paul Walker. Later, she starred in three sequels of the franchise. Personal life also made Elsa famous: she married one of the Hollywood heartbreakers, Chris Hemsworth; today, they have three kids. Elsa Pataky was born on July 18, 1976, in Madrid. Her father, José Francisco Lafuente, was Spanish, and the mother, Cristina Medianu Pataky, was Romanian. The parents had nothing to do with cinematography: the father worked as a biochemist, and the mother was a publicist. The girl’s grandfather from the maternal line was a famous Romanian actor; he woke the passion for drama and theater in his granddaughter. He brought up the girl when José left the family and Cristina was busy with her work. Elsa did not want to contradict her father’s will and entered the University of San Pablo in Madrid where she studied journalism. At the same time, the young woman was devouring books and took up acting classes. Soon, she joined the Teatro Cámara de Ángel Gutiérrez acting company. Elsa took the short and harmonious second name of her grandmother from the maternal line, Rosa Pataky, and began her acting career. Elsa Pataky debuted in the short movie Solo en la Buhardilla. Soon, the roles in the popular Spanish series La Vida En El Aire and Al Salir de Clase followed. Because of the busy schedule, the actress had to quit the university. These TV projects made the woman a local star. In 2000, Elsa played Vera Hidalgo in the British and French TV series Queen Of Swords. The language barrier was not a problem: Spanish and Romanian are the actress’s native languages, and she speaks good French, English, and Italian. Elsa demonstrated her bright drama talent; Spanish and other European directors took an interest in her. In 2001, Elsa appeared in the movie Don't Tempt Me. Although her role was minor, she had the chance to work on the same project with Penélope Cruz, Fanny Ardant, and Gael García Bernal. In 2004, the Spanish and British movie Romasanta came out. This project was nominated for the main prize of the Málaga Film Festival. The global screening made Elsa Pataky the rising movie star: she started receiving many offers from American directors. In 2006, the photos of the beauty appeared on the cover of Maxim: she was wearing a swimsuit and had a huge python on her knees. International clothing, perfume, and jewelry brands invited Pataky for photo sessions. The Spanish artist debuted in Hollywood with the movie Snakes on a Plane starring Samuel L. Jackson and Julianna Margulies. In 2009, Pataky played the victim of the maniac in the thriller Giallo by the Italian director Dario Argento. The actor Adrien Brody was a guest star from Hollywood there. The artist earned the real fame only in 2011 when she played Elena Neves in a new iconic movie Fast Five. Elsa Pataky was so natural in the movie and cast that she was invited to the following sequels. In 2013 and 2015, the blockbusters Fast & Furious 6 and Furious 7 came out. Jason Statham appeared in the latter. In 2017, The Fate of the Furious was released. Overall, the actress’s filmography includes dozens of roles. The Spanish actress is known for her strict views. There is no information about her romantic relationships in youth. There is only one affair known to the public: the romance with the actor Adrien Brody. The couple starred in the movie together, and they felt attracted to each other outside the movie set. The relationship lasted for about a year, and Brody proposed to the woman. Still, the chain of conflicts and misunderstanding caused by jealousy followed. Eventually, the actor broke off the engagement. The actress dreamed of a wedding. 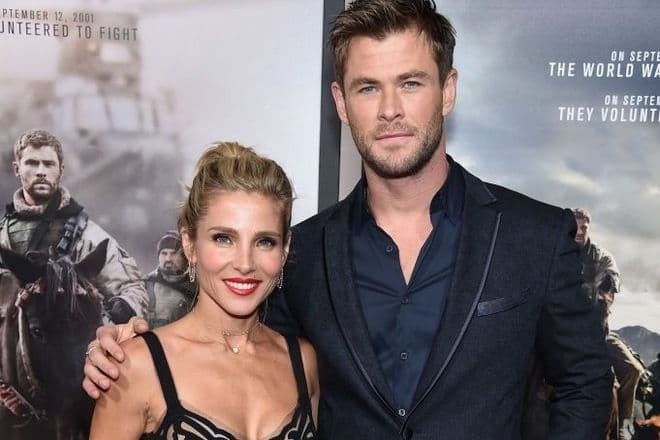 Soon, her dream came true: on December 26, 2010, Elsa Pataky married Chris Hemsworth, the Australian actor famous for the role of Thor in several superhero movies. The ceremony became one of the most discussed weddings in Hollywood. Fans admired the brilliant couple and wished them a long and happy life together. However, some people wondered why the popular actor married the Spanish actress who was seven years older than he. The couple does not keep secret the family life: the actress posts many photos on her Instagram page, from the children’s first steps to birthday parties. Today, Hemsworth’s large house is being built; it will occupy 4.2 ha near the coast of the ocean. Chris’s brothers and parents will also live in the mansion. In 2018, the premiere of the America war drama 12 Strong about fighting terrorists took place. Elsa Pataky and her husband Chris Hemsworth participated in the movie. Further on, the actress began to work on the Australian series Tidelands.